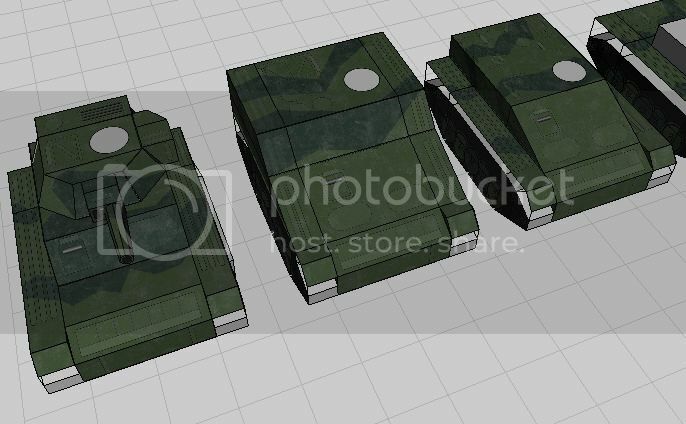 It's a futuristic version of the CVR(T), currently has parts for a light tank with either a 76mm Cannon or a 40mm Autocannon, APC or Command Vehicle. 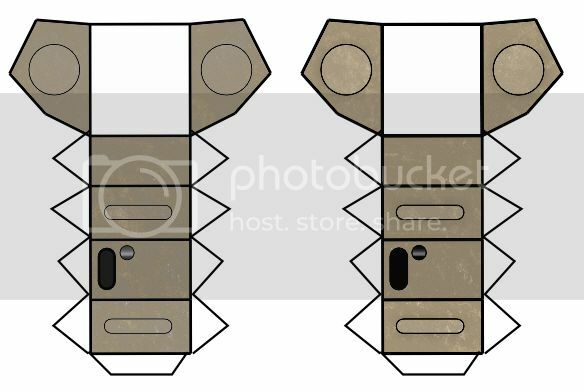 Comes in 4 different unmarked colour schemes (Desert Tan, Temperate Green, White and Field Grey), as well as 2 sets of character schemes with markings. Feedback is appreciated, especially constructive criticism and suggestions! Planning to add some more variants and colour-schemes in the future, so watch this space! Wow! Looks great! I am currently too busy to test-build or give feedback right now, but I am impressed with the overall model. EDIT: I love the humor! Henry Morgan. Why not both. 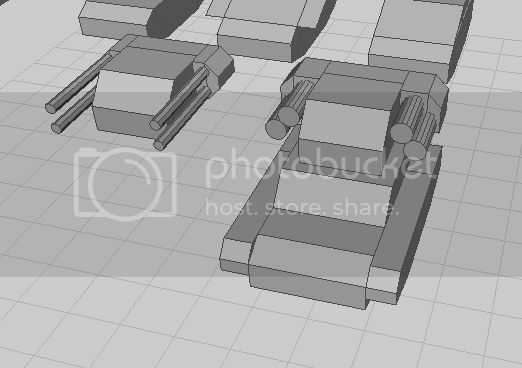 I like the idea of sleeves to allow turret motion. Reading through the documentation, it matches up to what I see in the pdf's, so it should build well. I do think that it would be nice to have pictures of some of the variations. There is an awful lot here. Have you calculated how many different variations are possible from the kit? Thanks for adding that. These should build up very well. I don't say that from actual building, but I've built enough that I can generally pick up on tricky parts. I think these will be very good. 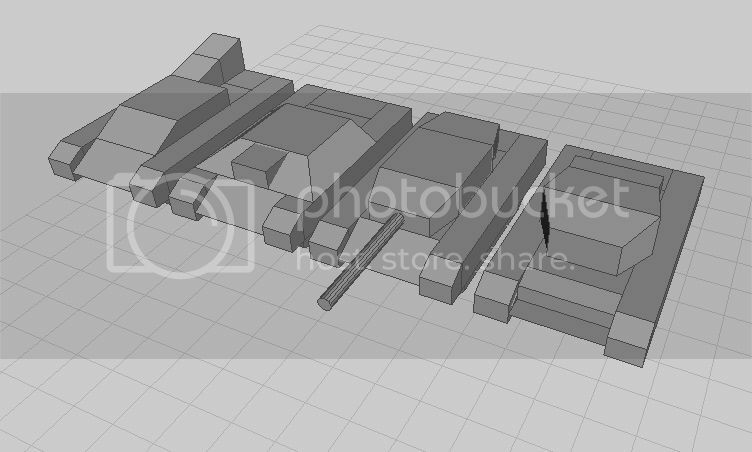 There's a lot of stuff I want to add to the current model before I'd start resizing it, though. Anyway, here's what I've been working on. I also bashed up a prototype 15mm LWTV. I want to test-build it before I release it though, so I can work out any kinks. My Brother printer lasted 9 years before it died, so I got another one. The MFC-J430W does the 4-cartridge set-up for printing. It has done okay on handling card without getting page jams on mere paper, so far. Used it almost a year and have yet to need to change ink cartridges, though Black and Yellow are running low. I also recommend HP, my old Photosmart 6520 has been my workhorse for years. I had a Canon that was prettier, but it died after just a few years. Thanks I'll have a look at Brother. You have to think of a printer purchase as being a licensing agreement to buy ink or toner. Quite often, the cheaper printers have more expensive ink. You just have to check around. Look for features that you want or need. Then ask about people's experiences. I got a HP laser color, it´s another dimension of print, i have for almost 4 year, i printed my wedding cards (200 cards) and i have 55% black toner and the other 3 have more o less 60 % and i never change the toner cartrige. The prints look great even in a normal a4 paper it looks satiny. I´m in love with my printer . I know the catridge is expensive but i have them for 4 years and think at last for 4 more. I like lazer printers, too, but my son bought me this one (inkjet). Some people have problems with flaking with lazer printers, but if you spray the page with Krylon clear gloss or clear matte before you score and cut out, you have no problems. I do that with all my models. If glue gets in the wrong place, it is easy to clean it off without damaging the texture. It also helps make the models more sturdy. I toyed around a bit in my image editor, and improved the texture by, I guess, about 2 microfoxes. On the printer front, I've almost got "the one" nailed down, does anyone have any experience with the HP Photosmart 5510? Is there any reason I shouldn't get one? Say, it'll only print pictures of clowns, or even worse, it turns everything you print into something clown-related. It's not that I have coulrophobia or anything, it'd just be really inconvenient. I'm a little late on catching these but I must say they look really neat! Also the amount of modular parts is simply awesome! Is there a rocket pod one by chance, Lol? On the other hand, they don't hate it, or regret buying it. Good, I was waiting for the 1.000 002 foxes tanks! These look really cool, thanks. I'm currently ahead of my workloads so I'll take some time out tomorrow to print and build one of these babies. I'm curious how they stack up next to a Terra Force Wolverine or a Bel's Kitty. LWTV shown with Terra-Force Wolverine Heavy tank from One-Monk Miniatures and Bel's Kitty Superheavy tank from Finger & Toe Models. Sorry about some of the roughness in the build, my fault from rushing a couple of things. One suggestion I have is to include the pictures (even renders help) in the instructions document for referral purposes. Bell's Kitty is huge! My compliments to finger and toe! They really for a nice big happy family, don't they? I just want to build a whole bunch of LWTVs now! Please, tell me what program you make your 3D models? Hi Tomoko. I'm happy to see you. Ciao ( from Italy ). I'm really not the right person to answer you. I do not have skills and knowledge in this matter. I'm sorry. 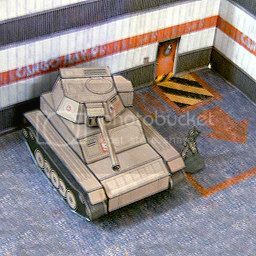 KV-12 LEV SUPERTANK" ( www.wargamevault.com/product_info.php?products_id=92618&filters=0_0_0&manufacturers_id=797 ) by "Finger and Toe Models ( www.fingerandtoe.com/ ). A great producer. 2- The central model is the "Wolverine" ( medium tank I suppose ). The support for the Terra Force army ( onemonk.com/terra-force ). By Jim Hartman ( aka Onemonk ). The founder of this forum and spiritual leader of all the paper minis of this half of the world. I hope for his return to the hobby soon. Unfortunately, this model is no longer for sale, today. 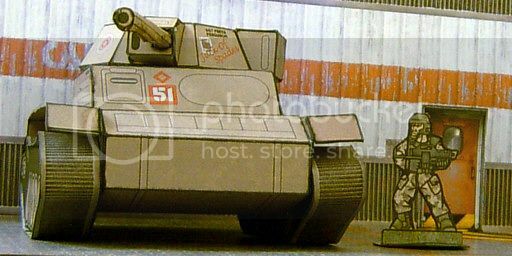 3- the last model ( and all his variants ), the main subject of this topic, is a "LWTV(T)" by the very skilled "echelon". So three models and three different artists/graphic designers. I don't know if they use classical 3D drawing programs or specific programs for card models. 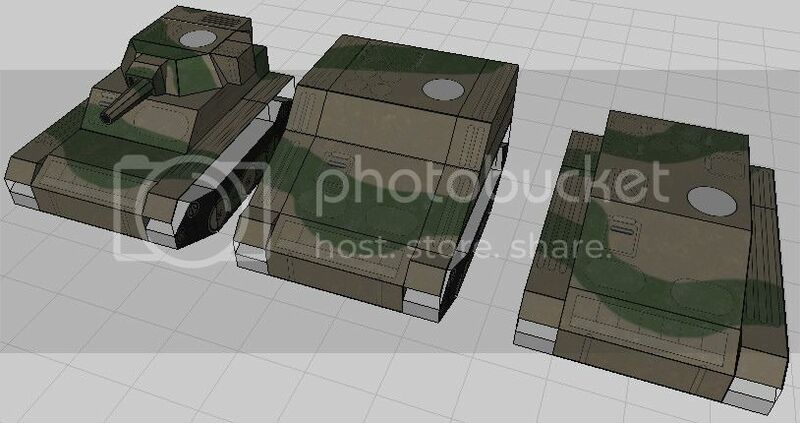 If you are interested in Pepakura Designer license, send me an e-mail or a pm here, please. Just saw the picture at the top of the thread... sorry. 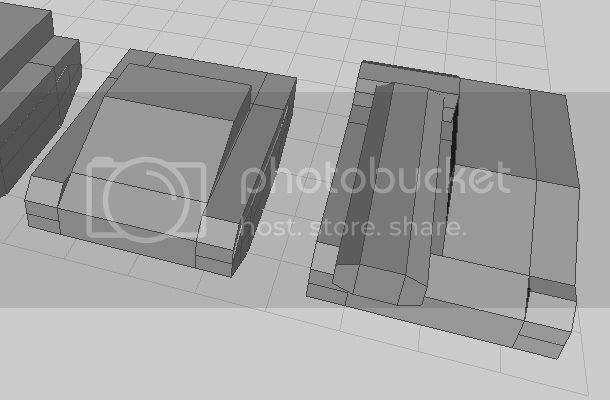 2) would you like to share your 3DS model, or the vectorized flat-folded result (the SVG, right?) ? 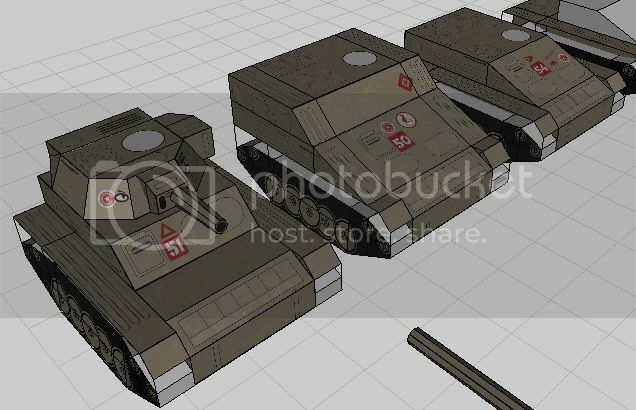 I could use an AT-43: UNA version of it (so i could use the "white" vector drawing), and try a thing i have in mind (and here's when the 3D model could help).